When the hardware acceleration is used it is possible playing a full HD video by using a very low percentage of CPU. Entry Point refers to the point in which software passes workload to Hardware. Since VLD is earlier than MC, more processing is done in hardware if entry point is VLD. The software used to play the video has to be capable with the Intel® SCH US15W chipset hardware acceleration. Some tests have been done in order to find the software that can work properly and the right codec configuration. Those tests have been done under WXPE with the graphics drivers IEGD (version 10.3) and IEMGD (version 1.5 beta). Here the workflow thus has to be followed to get the video file coded in the right way: the video has to be imported in VirtualDub. By opening the “Select video compression” window in VirtualDub (Video-> Compression) it is possible to select the ffdshow in the list of installed codecs. Then by clicking on the “Configure” button it is possible to set the ENCODER and the FOURCC to the entry H.264. A FourCC (literally, four-character code) is a sequence of four bytes used to uniquely identify the video codec used in AVI files. This means that the FourCC code is used from the player software to determine which codec has been used to encode the video. If the FourCC has a wrong value not equal to H.264, MPEG-2 and VC-1 (e.g X264 or AVC1), the playing software will not use the Hardware Acceleration decoding. The following image shows the ffdshow video encoder configuration window with the ENCODER and FOURCC fields correctly set. The encoding process has to be started (File->Save as AVI) and in order to get the final video file. This file can be played with the above mentioned Player by using a very low CPU percentage (a value between 6% and 15%). 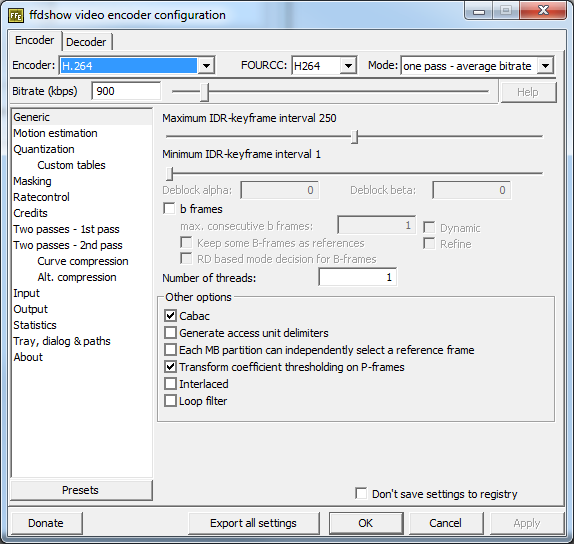 The following image shows the ffdshow video encoder configuration window with the ENCODER and FOURCC fields correctly set.